For diagrams of equipment needed for box lacrosse, click on the thumbnail to the right. 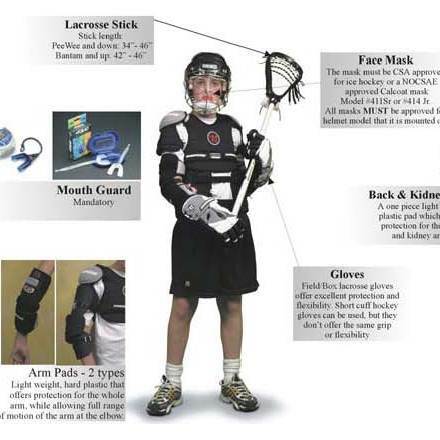 Helmet with face shield (both CSA approved), shoulder pads, gloves (hockey gloves are okay), athletic support (boys must wear a “Jock” with plastic cup and girls must wear a “Jill”, mouth guard, elbow pads (recommended), knee pads (recommended) and a junior lacrosse stick. All players must wear at all times the following equipment: helmut, mask (CSA approved hockey helmut and mask alright), elbow pads, mouth guard, gloves (hockey alright), jock with cup or jill strap, shoulder and arm pads and back/kidney pads. Stick minimum of 34 inches in length. Knee pads are optional. Same as Tyke except: arm slash guards (mandatory), kidney/rib/back slash guards (mandatory). TO SEE IF YOUR HELMET/FACEMASK IS APPROVED FOR USE BY THE CANADIAN LACROSSE ASSOCIATION, CLICK HERE. Goaltender Equipment, other than helmet/face shield and gloves (younger divisions), is provided for the duration of the season. Uniforms are supplied for all players for the season. Please keep in mind that uniforms are a big expense for SLA and taking proper care of them is extremely important. These uniforms are only being loaned out to the players and do not belong to our players. Therefore players should not be wearing the club uniform for purposes other than lacrosse games. If players are unable to comply with this then we will have no other alternative but to implement a charge for the usage of uniforms. DO NOT WEAR YOUR JERSEY FOR PRACTICES! Shorts are supplied as part of the registration fee and are the player's to keep. Please check the size for your child’s shorts at registration day. Then make a note on the top left edge of your registration form as to what size shorts your child needs for this season. This should ensure that each player has shorts that will properly fit them. All items bearing the Surrey Rebels logo or Surrey Lacrosse Association name MUST be ordered through Surrey Lacrosse Association via your team manager. Thank you for your co-operation in this matter. To foster team spirit and participation we encourage you to support the association by purchasing Surrey Rebels apparel, bags, and other branded gear. Visit our Team Gear Page to view our selection of hats, shirts, jackets, shorts, socks, bags, sport bottles, etc. available for purchase.